Monday morning found the Pintos playing the Dalmations at San Miguel in a nippy and tricky wind, but the Mustangs persevered and came away with a very good result, taking 4 of the 5 rinks and the overall shots. Malc Sykes, John Skipper and Jim Gracie 20-10. Ann C Taylor, Denise Morgan and Bob Taylor 20-16. Ron Greenstreet, Diane Yates and Bob Morgan 20-13. Irene Thomson, Keith Cunningham and Eddie Thomson 20-16. Brian Gilham, Paul Durham and David Whitworth 13-20. Meanwhile the Raiders had a bye.The Palominos were at home to another San Miguel team, the Pointers, who went away with all the points. But there is no shame in that, as all continue to hone their skills and gain experience, with two of the rinks losing by just one shot. On Friday morning the Rangers took on Emerald Isle Outlaws at home and although they took just one rink, they lost another by just one shot and had another close match. However with the introduction of 5 rink matches and more team, I think some players are in a lower division than they would have been and it is only fun after all. Meanwhile the Mustangs were at San Luis playing the Tigers and played some tough matches, but came away just the one rink, but we had good fun and some interesting bowls. For the third time in seven days Country Bowls played host to a team from La Siesta ( they must like us! ). The Pioneers arrived full of optimism but left feeling down after a heavy defeat. Well done Flamingos. Winning rinks: Agnes Burke, Pat Ray & Brian Ray 30 – 8, Rob Hallam, Graham Richardson & Jim Rennie 16 – 12, Craig Dyson, John Burke & Dennis Birkett 25 -11, John Jukes, Derek Jiggins & Geoff Paylor 20 – 9. Great result. Middle of the league Country Bowls welcomed leaders Greenland’s Cedars to a wet and windy miserable Friday morning in the Valle Del Sol. The Cubs stacked up ready to do battle and try to improve on their 10 – 2 defeat from the first leg. Everyone dug deep and the standard of bowling was exceptional, the Cubs held their own at the half way mark. The wind continued to blow and the bowling didn’t ease. In the end, the newly developed Cubs for this season took the spoils on three rinks and drew on one giving an overall score of 9 – 3 to the Cubs. Winning rinks; Chris Stevens, Craig Dyson & Andy Bryce. Steve Mattison, Agnes Burke & Lynne Bryce. Sandra McIlroy, Dot Davies & Peter Robins. What a fantastic and encouraging result. Well done Cubs. In the afternoon the Geckos travelled to Quesada to play a strong team currently lying third, just one point behind the second place team La Siesta Golds. Quesada proved to be too strong for the Geckos winning on three rinks and winning the overall shots. In the Discovery Division, the Sycamores were away to Vistabella Eagles. Final score – 131 – 54. 10 – 0. Best winning rink was Phil Lockley, Mary Lockley, skip Mel Brown. 37 – 6. In the Discovery Division the Maples were at home to Mazarron Mariners. Final score was 99 – 60. 12 – 0. Best winning rinks – Rudy Wattley, Jeff Hier, skip Derek Sale. 23 – 9. In the Voyager Division The Chestnuts were at home to San Luis Romulons. Final score – 74 – 102. 3 – 9. Best winning rink was Doreen Watt, Roger Farrington, skip Graham Watt. 20 – 18. In the Winter League we were at home to Quesada, final score shots 67 – 91. points 2 – 10. Winning rink was – Lynne Morris, Jean Giddings, Mike Kelly, skip Tom Hill. 16 – 13. In the Fed 4s the Beech were at home to San Luis Bazas. Final score – shots 60 – 39. Points 8 – 0. Best winning rink was Rita Hart, Dave Thompson, Jim Wilcock, skip Stuart Hamill. 26 – 13. The ashes meanwhile were away to Emerald Isle Leprechauns, final score – shots 51 – 53. Points – 4 – 4.Best winning rink M Stephens, S Cordell, J Hier, skip R Cordell. 21 – 17. 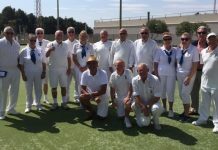 In the Voyager Div the Elms were away to Vistabella Swingers. final score, 62 – 125. 2 – 10. winning rink – D Field, J Bliss, skip D Thompson. 19 – 13. In the Southern League, the Cedars were away to Country Bowls Cubs. Final score 82 – 102. 3 – 9. 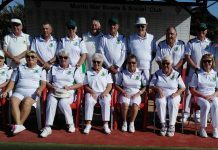 Last Saturday Horadada joined with Country Bowls to play the Provincial team, the game being held at Country Bowls. We only managed one winner so congratulations to the rink of Roy Thompson, Dennis Wade, Fred Trigwell and Brian Patton who won 19 – 12. One of our other men’s rinks had a very close match but were just pipped at the post. In spite of the result a good day was had by all as both the weather and the company were excellent. This was a good experience to play with what you would call ‘better bowlers’. Many thanks to Country Bowls for hosting the event and providing a very good meal afterwards. On Monday the Falcons in the Discovery Division were away to Quesada Rubies. Not a good result for us as we only won on one rink. Our winning rink was: Debbie Perryman Fred Trigwell and Barry Evans 14 – 12. The final result being 55 shots for to 83 against. 2 points to Horadada to 10 for Quesdada. Onwards and upwards Falcons, keep going. John Goddard, Jack Linehan and Barry Evans 18 – 15. Well played Guys. Final score was shots for 70 to 120 against. Points gained 2 to 10 against. Keep ‘em bowls a rollin’ Horadada. We can show ‘em! 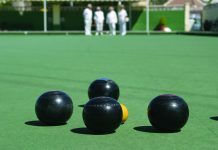 In the Voyager Division the Pioneers away at Country Bowls managed to win on the rink of Gordon Dall, Barbara Cooper and Dave Laverick but lost the overall shots by 102-53 picking up just 2 points. Better news in the same division from the Sputniks who defeated E.I. 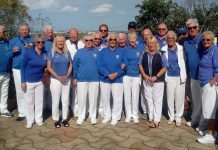 Saturns by a single overall shot 87-86 winning on 3 rinks and picking up 8 points.Winners for La Siesta were Gary Randall,Sheila Millward and Jim Eastwood 19-12,Hilary Clarke,Rod Edgerton and Alan Ralph 21-18 and Joe Kocsis, Ann Edgerton and Lee Plummer winning 17-15. 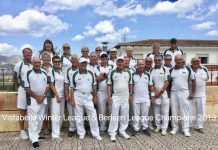 In the Winter League La Siesta visited San Luis and managed to win on 2 rinks picking up 4 points with the overall shots being 98-68 to San Luis.Winning rinks came from Irene Laverick,Tony Dalton,Pat Harman and Jenny Bowman 24-9 and Barbara Cooper,Val Dalton with Florence and Mike Edwards 18-14. In the Fed 4’s the Parakeets entertained Montemar Lords and managed to win on 2 rinks and won the overall shots by 61 shots to 39 picking uo 6 points. The Hoopoes lost their home match against Country Bowls without winning on any rink. In the Southern League A Division the Blues visited Vistabella Picadors and shared the points 6 each with Vistabella taking the shots 74-69.Pat Harman with Derek Smith and Alex Morrice best winners 16-8. 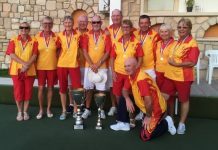 The Golds in B Division entertained Montemar Matadors and had a 92 shots to 74 win picking up 11 points from 4 wins and a draw.Heading the winners were Doug & Fay Beattie with Ros Stockell 19-11 closely followed by Tony & Val Dalton with Rab Logan 20-15. In Division C the Silvers were at home to San Luis Pumas and in a match with only 2 shots separating the teams beforen the eighteenth ends the Silvers pulled away to a victory by 97 shots to 87. The match finishing with both teams getting 6 points thanks to Janette & Lee Plummer with Wendy Ralph winning 28-7 and Kathleene and Noel Morrisroe with Willie Mcvey winning 19-18. In the South Alicante Winter League Quesada Pearls travelled to San Miguel to play the Alsations this week. After a very competitive and close match, the Pearls won on 3 rinks, lost one and drew one. So they won overall 9 – 3 points with the shots 91-88. This means they’ve held on to their 4th place in the league just 2 points behind San Miguel Beagles. Meanwhile, Quesada Diamonds entertained San Miguel Beagles at home. Good mornings bowling with some really close scores, 3 rinks were won on the last end, against a very strong San Miguel side. Despite some close games, the Diamonds only won on one rink so the result was a win for San Miguel 10-2. Reflecting the tight match, the overall shots were close at 101-96. The Rubies had a very successful morning when they played Horadada Falcons winning the match 10-2 and the shots 83-55. On Friday, in the Southern League, Quesada Swans were up against Montemar Torreadors, who were on form and held the Swans at bay winning the match 8-4 and the shots 90-84. 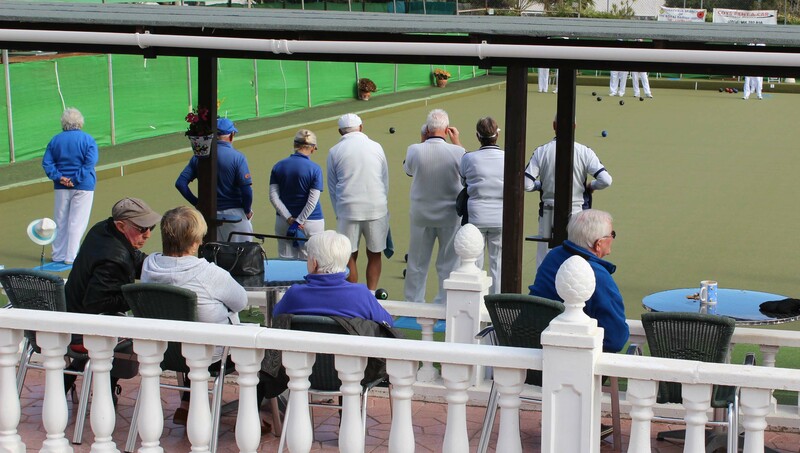 Whilst Quesada Swifts hosted Country Bowls in an afternoon match. Both teams were on good form and there were some really tight heads and close finishes. Three rinks were decided by one shot two in Country bowls favour, one won by the Swifts. Overall the points were 8-4 to the Swifts with the shots 97-73. In the Winter league, Quesada played away at Greenlands and won the match 10-2 points, with 91-67 shots. Quesada are currently 5th place in the Winter League and with only 3 points separating 3rd, 4th and 5th places there’s everything to play for in the coming weeks. In the Federated 4’s, Quesada Panthers hosted another of the San Luis teams, the Ospreys. This time San Luis were the victors with 8-0 points and 86-36 shots. San Miguel Pointers continue with their good form playing away to El Rancho Palaminos gaining all 12 points (111 shots to 63) equal best trios Anne & David Young and Stuart Hemmings 29 – 8 and James Cutting, Brian Allen and Lynn Greenland 28 – 7. 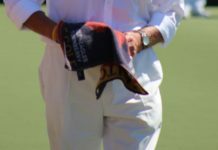 San Miguel Beagles were away to Quesada Diamonds winning 10 – 2 (101 shots to 96), the best trio were Brian Miller, Val Collins and Lin Miller 22 – 17. 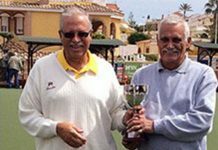 San Miguel Alsations were home to Quesada Pearls losing 9 – 3 (91 shots to 88), the winning trio were Jan Farmer, Derek Farmer and Mike Douglas 24 – 8. San Miguel Dalmations were home to El Rancho Pintos losing 10 – 2 (93 shots to 75), the winning triple were Stan North, Bob Graham and Frank Scotthern 20 – 13. In the Winter League San Miguel were away to The Emerald Isle losing 8 – 4 (86 shots to 81). The best winning rink were Allan Patterson, Bob Graham, Mary Dyer and Lin Miller 24 – 10. In the Fed 4’s San Miguel Cherokees and Apaches both had Bye’s. San Miguel Mohawks were home to San Luis Condors, winning 6 – 2 (69 shots to 32). The best winning rink were Bob Nesbitt, Jack Jackson, Cyril Medley and Dave Champion 29 – 7. On Friday San Miguel Boxers were home to Horadada Royals, winning 10 – 2 (120 shots to 70). The best winning trio were Sheila Errington, Peter Masters and Brian Errington with 33 – 11. San Miguel Bulldogs were away to The Emerald Isle Cavaliers, where they shared the points 6 – 6, (75 shots for 82 shots against). The best winning trio were Pat McEwan, Shiela Booth and Dave lMcEwan, 19 – 8. WINTER LEAGUE. Away this week at La Marina and another excellent result to put us back on top of the league table, four winning rinks & one just losing out. Shots, VB 104(10) – 64(2) LM SAL ENTERPRISE LEAGUE Albatrosses were away to San Luis Trekkers, the scores reflect a good game and the end result was brilliant, with wins on all rinks they scored a full house. Shots, VB 94(12) – 68(0) SL. The Drivers also away at San Luis didn’t do as well playing the Klingons, they only took one win from this top team. Shots, VB 67(2) – 124(10) SL. DISCOVERY LEAGUE Eagles were at home playing Greenlands Sycamores, hoping for a few good points but unfortunately losing on all rinks. Shots, VB 54(0) – 131(12) G.
VOYAGER LEAGUE the Buggies were at home, playing the San Luis Vulcans, this was the second of our teams this week to score a full house with wins across the board plus a big shot difference. Shots, VB 148(12) – 40 (0) SL. SOUTHERN LEAGUE A Div. A home game for the Lanzadores playing La Marina Ospreys, what a battle this was..hard fought until the end, the Lanzadores finished with wins on four rinks, the fifth was a couple of shots short but a great result regardless. VB 93(10) – 80(2) LM. The Picadors were also at home playing the La Siesta Blues. They had two wins and the overall shots despite failing to field a full side. Shots, VB 74(6) – 69(6) LM Div C Swingers away to Greenlands Elms, they had four wins and one defeat. 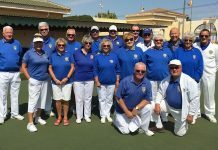 Congratulations to Kevin Hardy, Sandra Burrows & Maggie Furness for scoring a ‘Hot Shot’ VB 125(10) – 62(2) G.
Conquistadores away to La Marina Merlins played a close game but had nothing to show for it…hard luck! Shots, VB 68(0) – 99(12) LM. 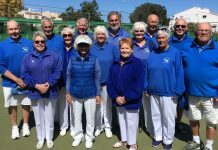 SAN LUIS BOWLS CLUB REPORT 01.02.19. Another busy week for all our teams, with some great results & useful points, although not everything went to plan. SA League Monday 28th Klingons home v VB Drivers, a great result; 124shots-67, 10pts-2. Winners: Colin Jackson, June & Keith Jones, 36-6, Kath Reid, Pam Lockett, Ian Kenyon 18-14, William Holtham, Sabrina & Russell Marks 24-13, Bob White, Giuseppe Galelli, Peter McEneany 33-10. Trekkers home v VB Albatrosses, a tough match 0-12, 68 shots-94. Romulans a great result away v GL Chestnuts; 9-3, 102shots-74. Winners: Pauline Johnson, Chris Lythe, Ralph Jones 23-7, Chris Phillips, Dee Hoey, Joe Millis 21-14, Pat Barnes, Danny McErlean, Tom Fromson 20-20, Robert Hicks, Rob Bruce, Lyndon Johnson 20-13. Vulcans away v VB Buggies, a hard day at the office: 0-12, 40shots-148. Wednesday 30th Winter League: a better result home v La Siesta, 8points-4, 98 shots-68. Winners: Pam Lockett, June Jones, Peter McEneany, Keith Jones 23-9, Kath Reid, Giuseppe Galelli, Neil Morrison, Ian Kenyon 30-10, Ray Clarke, Drew Russell, Sabrina & Russ Marks 22-7. FED 4’s League: Thursday 31st Ospreys an excellent result away v Q Panthers: 8-0, 26shots-12. Winners: William Holtham, Janet McEneany, Ann Holland, Peter McEneany 20-14, Pam Lockett, June Jones, Ray Clarke, Keith Jones 40-10, Giuseppe Galelli, Margaret Clarke, Scott Malden, Ian Kenyon 26-12. Condors away v SM Mohawks, fought hard for 2pts-6, 32 shots-69. Winners: Jan Pocock, Margaret Morrison, Bill Webb, Drew Russell 15-13. Bazas away v GL Beech, hard fought but unfortunately, 0pts-8 39shots-60. Southern League: Friday 1st Lions home v GL Oaks, another excellent result; 12pts-0, 110 shots-60 Winners: Kath Reid, Pam Lockett, Ian Kenyon 16-13, Bob White, Ann Holland, Ray Pollock 21-19, Margaret Morrison, Keith Phillips, Neil Morrison 17-14, Janet McEneany, Ray Clarke, Peter McEneany 21-9, Colin Jackson, June & Keith Jones 35-5. Tigers, home v ER Mustangs, a great result, 90shots-70, 10pts-2. Winners: Judy Carroll, Bill Webb, Derrick Cooper 18-16, Allen Bowen, Graham Bird, Suzi Cooper 17-10, Ros Holmes, Jan & Brian Pocock 19-10, Shirley Verity, Jo & Jules Pering 25-10. Leopards away v La Manga Crusaders, hard work and some close games but: 0-12, 45shots-125. Pumas, away v LS Silvers, useful points: 6-6, 87shots-97. Winners: Pat Barnes, Mary Fromson, Danny McErlean 24-20, Chris Phillips, Robert Hicks, Lyndon Johnson 18-13, Val & Allan Lever, Tom Fromson 20-17. 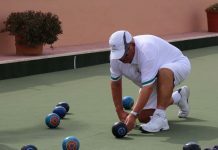 For information, SLBC website: www.sanluisbowls.byethost7.com or contact June Jones, Club Captain: 691903773. Línea Directa Championship rolls out at Greenlands.